Who should take Horse Chestnut Extract? It’s estimated that 25% of women, and around 10-15 % of men are regularly affected by at least one of these symptoms. The horse chestnut tree which bears the fruit originated in the Balkans (especially in Bulgaria and Albania) and is now found throughout Europe. Traditionally, the whole seed was used (and sometimes even the leaves and bark), but since it was discovered that it contained an anticoagulant called aesculin, producers of natural extracts are required to remove this molecule. Flavonoids (particularly quercetol and kaempferol), which give the horse chestnut fruit its pigmentation (1). Saponosides (the most active principles of which are aescin and b-aescin). Horse chestnuts are often confused with chestnuts because they are morphologically very similar. Venous insufficiency is characterised by changes to the vein wall (leading to the development of varicose veins), hormonal fluctuations (resulting in increased elasticity of the vein wall) and dysfunctional valves. It manifests in poor blood flow in the veins. It’s mainly the legs which are affected – they become heavy, painful and swollen as blood accumulates. It eventually leads to the permanent formation of unsightly varicosities: damaged veins that are blueish, twisted and prominent. What are horse chestnut’s mechanisms of action in relation to blood flow? The aescin it contains maintains the permeability and tone of the vein wall (venotonic effect) (2), which helps blood return to the heart, particularly in the superficial capillary vessels (3). Increasing levels of the energy molecule ATP (decreased levels of which are associated with venous insufficiency). Reducing the activity of phospholipase A2, an enzyme which releases inflammatory mediators in blood vessels (4). Also reducing adherence of neutrophils (immune cells which are immobilised and aggregate on the inner surface of blood vessels) and inhibiting the activity of an enzyme called hyaluronidase which breaks down capillary walls (5). antioxidant (increases in reduced glutathione) (6). What does science have to say about horse chestnut? Neiss et al demonstrated alleviation of leg pain and oedema in individuals supplementing with 300mg of horse chestnut extract (7). Lorh et al showed a decrease in leg volume with the same type of supplement (8). Pilz et al obtained similar results (9). Diehm et al showed aescin to have a similar effect to that of compression stockings (10). Koch et al demonstrated positive effects for aescin and pycnogenol (a molecule found in French maritime pine bark) on venous insufficiency (11). Are there any risks associated with taking horse chestnut? Horse chestnuts are sometimes described as poisonous. This is because of a toxin called aesculoside which has been carefully removed from the supplement Horse Chestnut Extract. Apart from this, the only other change is the increase in aescin, a thoroughly well-tolerated molecule. What are other measures can be combined with horst chestnut supplementation? Wearing anything too tight on your legs or around the abdomen. Sitting with your legs crossed. Wearing unsuitable shoes (very high heels). Engaging in intense sports (such as volleyball, handball or football). Keep flexing your feet when sitting for prolonged periods. Take a cool shower at the end of the day, beginning at the ankles and moving up to the thighs). Engage in regular, gentle exercise, such as walking, swimming or gymnastics. Wear compression socks or stockings: they help stimulate venous return and prevent blood from pooling. Eat a diet high in plant fibre (fruits and vegetables). Can Horse Chestnut Extract be combined with any other supplements? 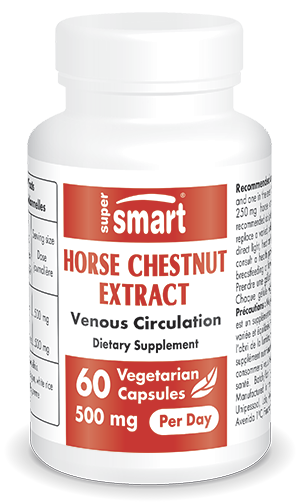 Horse Chestnut Extract combines well with other natural venotonics such as Lympathonic, a sweet clover extract with a high coumarin content, and VeinoMax, a natural formulation containing several plant extracts good for circulation problems. How should Horse Chestnut Extract be taken? A number of scientific studies show that the aescin in horse chestnut offers excellent bioavailability, particularly when the natural extract is taken outside of mealtimes. It is therefore advisable to take Horse Chestnut Extract in the morning, and again in the evening before bed.